Last year I knit my one and only lace shawl, which I absolutely love, but up until today it sat folded in a drawer because I couldn't figure out how to arrange it in a way that didn't look silly. 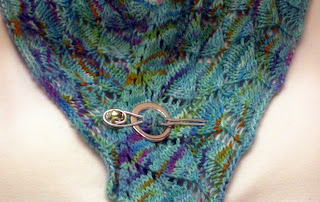 Today while getting ready to attend a knitting class at my local yarn shop, I threw it on at the last minute and secured it with the new shawl pin a friend gave me for Christmas. I was surprised and pleased to see that it was a perfect match with the shawl and actually looked nice held together like that around my neck. Thanks, Cathy! I had a scare later in the afternoon. When I got home from the grocery store my purse was missing and I thought I had left it in the cart in the parking lot. 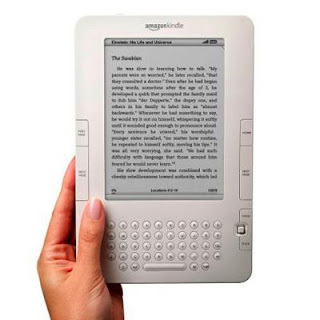 When I started thinking about everything I could lose, I quickly grew horrified ... my new Kindle (that I LOVE), phone, digital camera, medication, cash, credit cards ... oh my goodness, it would have been a terrible loss. I rushed out to the car and fortunately found it hidden under the seat. Then I said a million prayers of thanks. The Kindle was a holiday gift to myself. While I love reading books on it, the thing that really has me hooked is the electronic Scrabble game. It's addictive. The creek trail across the street from where I live is beautiful this time of year with bare trees and intensely green grass. 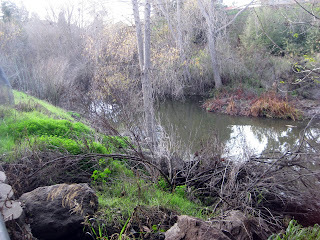 I love to take walks and enjoy having a trail within walking distance of my apartment. 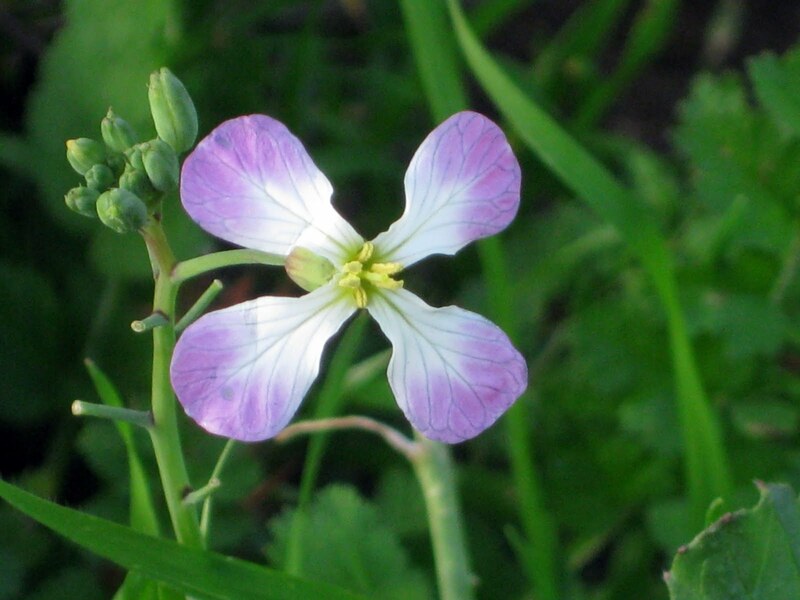 On a recent walk I came across one tiny, lonely little flower and had to stop to get a picture. I also discovered this giant nest partially hidden under a bush. It's about two feet tall and four feet across. I have no idea how it got there or what might live in it, but would love to know the story behind it. Charlie is the sweetest cat I've ever met. In our old place I used to walk him on a leash in the evening, but my new apartment is inside a building so I let him freely roam the hallway late at night. Tonight when he was sitting outside the front door I was stunned to hear him growl. Like a dog! A neighbor had entered the hallway and I guess he was protecting his territory. It was strange-- I never knew cats could growl like that. Well, off to bed. Warm wishes to you for a good week. That is a beautiful shawl, Stacy. You should wear it all the time. So glad you found your purse, I have done the same thing and it is very scary. I bought myself a kindle too. I am loving it, although I was in the book store this weekend and bought a knitting book. I only bought the one book so I did well. I hope you have a great week. Take care. 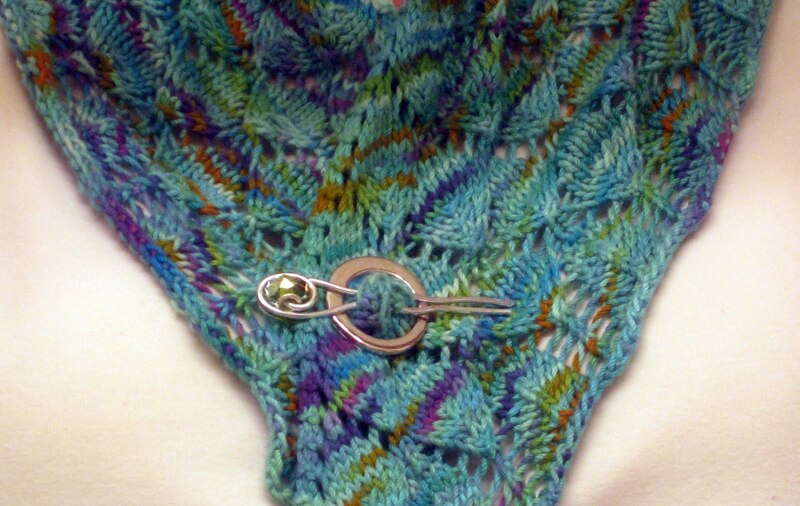 Beautiful shawl with the pin! Great Christmas gift and perfect for you! I had my purse stolen while on vacation years ago and it terrifies me to not know where it is! 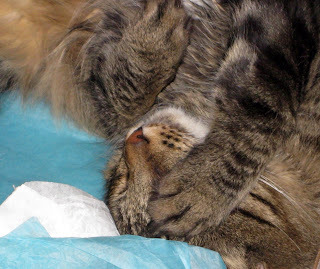 Love that sweet kitty, it looks like his hands are praying:) Have a blessed day my friend! HUGS! The shawl is beautiful and what a perfect gift. It takes a bit of verve to wear a shawl, but I love it when I do. I was watching the wedding show with David Tutera with Annie last night and they gave the bride a lovely shawl for her rehearsal dinner. It was long and red and reminded me of my first shawl - so I turned to them and said, see - it's not an old lady shawl! It's so nice that you found a flower. 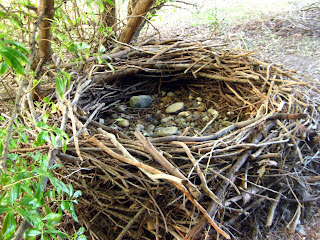 The only color here is grey...and wow, what a nest! the shawl and pin are indeed made for one another. many thanks to you dear Stacy for your kind comment. it has been nice to be welcomed back so warmly. That's so funny about Charlie! Just Saturday afternoon, I was sitting near Scruff who was looking out the window and he started growling -- I didn't know he could do that either. Then, about a minute later, the doorbell rang -- he was growling at the FedEx man. Too cute! Love your pretty new shawl and pin! And that nest -- wow -- that's big! I just came upon upon your lovely blog today. Your header is beautiful and I enjoy reading your posts. The shawl is very pretty. I have a shawlette I haven't worn because I feel silly in it. I know I have to get over that. Perhaps I need a shawl pin! Nothing is worse than losing your purse -- or even thinking you have. So glad it was a false alarm! I have a Kindle, too, but haven't blogged about it yet. I've downloaded Scrabble but haven't played it yet. Now I'm almost afraid to start!